🔷 Ugh – William Barr. See action 3 below for next steps. 🔷 Due to rain (which didn’t materialize), Alphabet Resistance was rescheduled to this coming Thursday, Apr 25, 4:45-6 pm. Join us in this energizing activity. Messaging is either last week’s SHOW HIS TAXES / FIGHT THE SWAMP or we may change over to HEARINGS NOW / NOT EXONERATED or a combo. Fill out your info on the Alphabet Resistance Apr 25 form and we’ll contact you with further details. We have 8 signed up so far and need another 8 to do the action. 🔷 Next Monday, Apr 29 from 1-3 pm in Bellevue is our next PostcardsToVoters. Who will we be writing for? Will it be Pennsylvania House Candidate Campaign Marc Friedenberg who lost his last race by 36 votes? We could push him over the finish line for the May 21st Special Election. Sign up at the link above to join us. 🔷 LWSD Residents – Don’t forget to vote by April 23rd! For more information on the LWSD Capital Projects Levy, click here. There’s still lots of wrangling happening in Olympia. Bills that are part of the budget process are still being weighed, and the House and Senate are trying to agree on amendments and various versions for each bill, a process known as reconciliation. To offer input, we have a few actions. As in past weeks, we’ve tried to make this easy for you by including the body of each email for you – just don’t forget to sign! Please support a strong version of SB 5116, the 100% clean electricity bill. It has passed both chambers and is needs to go back to the Senate for a final vote on its current version. Please pass a clean version of HB 1112, an important bill which will phase out the use of HFCs, which are extremely potent greenhouse gases. It has passed both chambers and needs to go back to the Senate for a final vote on its current version. Thank you for your leadership on SB 5602, the Reproductive Health Access for All Act! We appreciate your vote to refuse amendment 658. We will not stand by as access to reproductive health care is cut from our undocumented communities. I’m writing to ask that you continue to support and champion Indivisible legislative priorities, including Reproductive Healthcare & the Environment. You’ve sponsored and co-sponsored many of the bills this session that address these issues, and we really appreciate it. Now we just want to make sure these bills are successful in their floor vote! With just a few more days left before the next cutoff, I’m writing to ask that you continue to support Indivisible legislative priorities, which include the Environment, Healthcare, and Preserving Democracy. ✊ Action 2 – [WA STATE SENATE] Support Funding for Public Education and a Capital Gains Tax in Washington State! This is an urgent moment to for our schools and our state! Washington State has the most upside-down tax code in the nation. The Legislature has an opportunity to pass a capital gains tax this session on the extraordinary profits of 13,400 of Washington’s wealthiest residents when they make more than $200,000 in a calendar year on selling stocks, bonds, or property. An extraordinary profits capital gains tax will raise $2.68 billion in much-needed revenue. We need that revenue to be dedicated to the Education Legacy Trust Account to help fund Pre-K, childcare, K-12, and special education programs. We also need legislators to restore flexibility on local levies so as to prevent huge cuts for our public schools this fall. In addition, we shouldn’t use public money for charter schools (as would have been required in a “poison pill” amendment to an earlier proposed funding bill, SB 5313). Two articles from Washington’s Paramount Duty, one about the fate of SB 5313 and one about local levies and teacher pay, provide background about the actions of different Democratic senators. Some of them, such as Senator Wellman, have supported funding. Others, such as Senator Mullet, have blocked it. Even though Attorney General William Barr repeatedly attempted to spin the Mueller report in a way that exonerates Trump — the actual report told us otherwise, further proving to us that Barr is just another agent of the Trump administration. The report uncovered 10 instances of possible obstruction of the investigation into Russian interference in the 2016 election. In light of these revelations, we have two actions for you concerning Congressional oversight and investigations of the Trump Administration. Congress must gain access to the unredacted Mueller report as well as Trump’s tax returns to fully examine the extent of Trump’s malfeasance while in office and during the 2016 campaign. Rep. Jerry Nadler, Chairman of the House Judiciary Committee, has issued a subpoena for the unredacted Mueller report along with the evidence gathered during the investigation. Congress should also demand that former Special Counsel Robert Mueller, Deputy Attorney General Rod Rosenstein who oversaw much of the probe, and the primary witnesses in the investigation like former White House counsel Don McGahn, testify before Congress. “Hi, my name is [NAME] and I’m a constituent from [CITY, ZIP]. I’m calling today because I’m concerned about potential suppression of the findings of Special Counsel Robert Mueller’s investigation. I’m glad to hear House Judiciary Committee Chairman Nadler has formally subpoenaed the report and underlying evidence, however I also expect Congress to hold public hearings with Mueller, Rod Rosenstein, and other senior leadership of the Department of Justice and FBI as well as the primary witnesses in the investigation like former White House counsel Don McGahn. Action 3B – Demand the Treasury Department comply with Congressional request for Trump’s tax returns. On April 3, Rep. Richard Neal (D-MA), the Chair of House Ways and Means Committee, requested the release of Trump’s recent tax returns by invoking Section 6103 of the Internal Revenue Code. This law was used in 1974 to obtain President Nixon’s tax returns and again in 2014 to investigate the IRS’s handling of non-profits. On April 10th, Treasury Secretary Steven Mnuchin stated that the Treasury Department would not meet the deadline to release the president’s tax returns. Historically, these requests have been handled by the IRS Commissioner (currently Charles Rettig), but Rettig has deferred to his boss Mnuchin in this matter. Both Mnuchin and Rettig need to hear from Congress that they must release Trump’s taxes now, and not bow to pressure from the Trump administration to further delay the process. Trump’s taxes will provide critical confirmation of his potential financial conflicts of interest and entanglements. Congress needs to hear from their constituents that we are relying on them to push for transparency and release Trump’s tax returns. Rep. Suzan Delbene (WA-01) sits on the House Ways and Means Committee. This committee has the power to obtain Trump’s tax returns which could provide the American people a window into the President’s financial ties to foreign governments and corporations. Urge her to take further actions to obtain Trump’s tax returns and to be prepared to vote to subpoena the returns if the Treasury Department doesn’t comply. “Hi, my name is [NAME] and I’m a constituent from [CITY, ZIP]. I’m calling to urge [NAME] to demand the Treasury Department releases Trump’s tax returns as requested by Representative Richard Neal under Section 6103 of the Internal Revenue Code. It is unacceptable that Treasury Secretary Mnuchin evaded the request, and I expect [NAME] to pressure Mnuchin as well as IRS Commissioner Charles Rettig to comply and release Trump’s tax returns in a timely manner. Sat, May 18, 6:30-9 pm Eastside Democrats Dinner – Paint the Bench Blue – Snoqualmie. 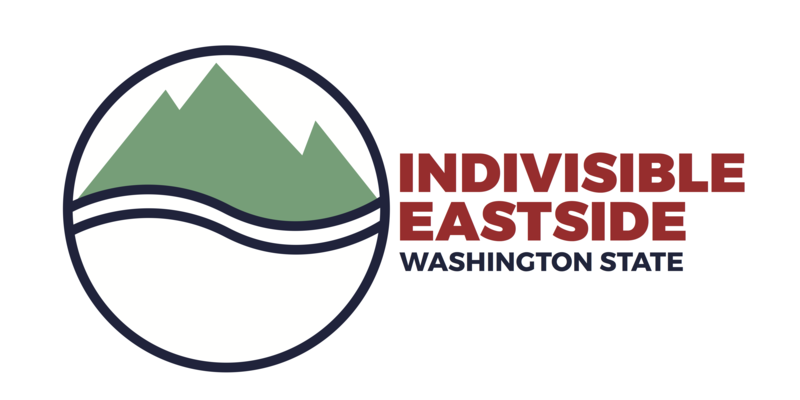 Register and Join the Indivisible Eastside table – 2 seats left! * More info on The River and the Wall. “The River and The Wall follows five friends on a 1,200 mile journey along the US-Mexico border from El Paso to the Gulf of Mexico. Riding horses, bicycles, and paddling canoes, they travel along the Rio Grande and meet with landowners, border patrol agents, congressmen on both sides of the aisle, immigrants, wildlife biologists, and folks on either side of the Rio to better understand where a physical border wall would go and the impacts it would have.” 88 more people need to sign up in order for this screening to happen at the AMC Pacific Place 11 in Seattle on May 2nd at 7:30. Click on the link above, gather some friends and head into Seattle!